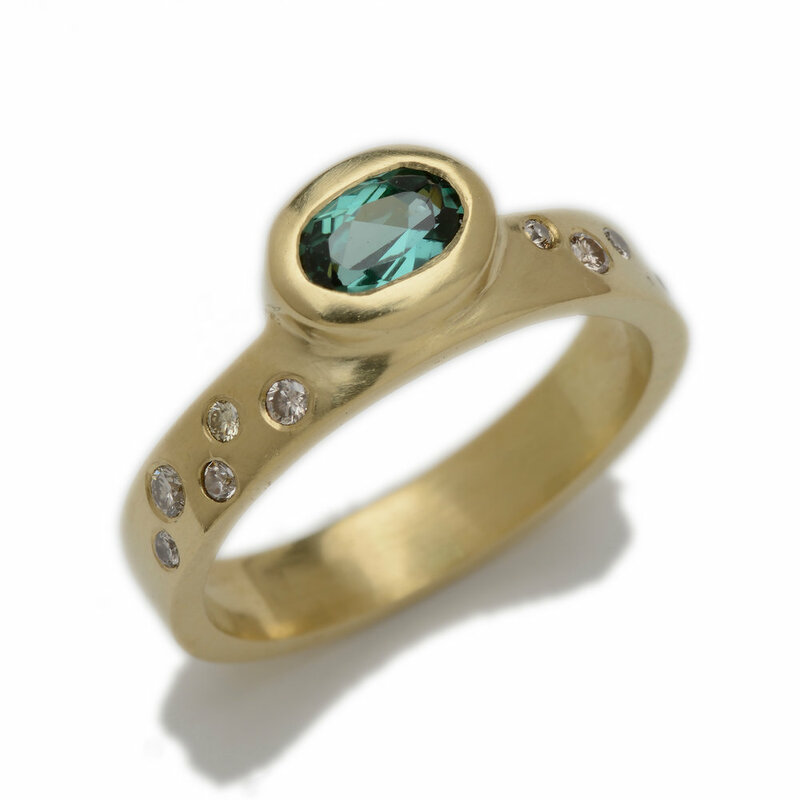 Custom Ring: 18k yellow gold, customer's own diamonds flush set into surface, oval faceted tourmaline. Custom Cluster ring: 18k Palladium white gold, Trillion Aquamarine, oval tourmaline, customer's own diamond. Custom ring with customer's own stone. 18k yellow gold, faceted round flush set diamond and Customer's Pear shaped family diamond. 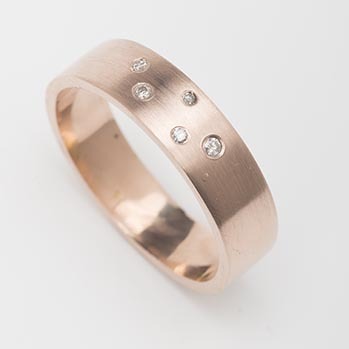 Custom ring: customer's own rose gold from old jewelry melted down into 5mm wide band with flush set diamonds. 5mm wide. Two Bands: 2.5mm wide textured band. 6.5 mm hammered and textured band. 18k yellow gold. 14k Pink gold, 4mm wide hammered band. Available in many widths, sizes and metal colors. 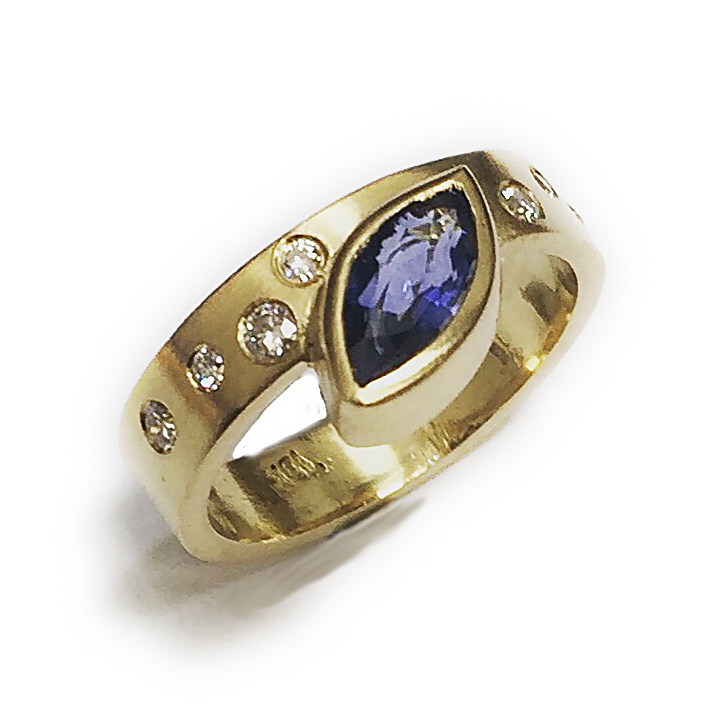 Custom Ring: Marquis Sapphire, scattered flush set diamonds, 18k yellow gold. Ring: 18 + 22k gold, 3 raw natural cube-shaped diamonds. 2mm wide band, sizing available, also available in different widths, prices vary. Ring: 18 + 22k gold, white 7mm x 6mm pear and 5mm black rose-cut diamonds. 18+ 22k yellow gold, Rose cut Marquise diamond, faceted flush set diamond. Ring: 'Balance' 18k gold band, peridot, blue zircon. available in many stone combinations. Ring: 18 + 22k Gold, Nigeran Phenakite natural crystal. 3mm wide band. stone is 10 x 15 mm irregular shape. More Nigerian Phenakite available, no two are alike. 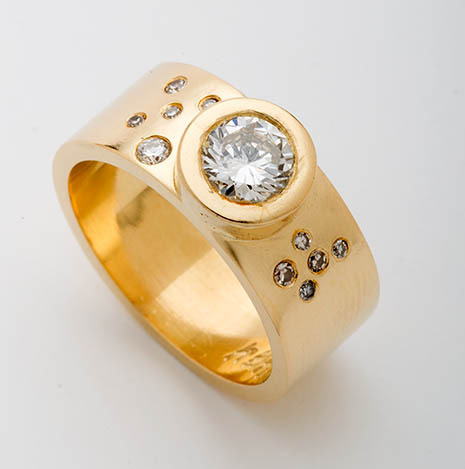 Ring:18k with customer's own diamonds. Ring: Asymmetrical 18k band with citrine, diamonds. 2 Rings: 18k white gold round 2.5mm band, 18k yellow gold wide band, customer's own diamonds. 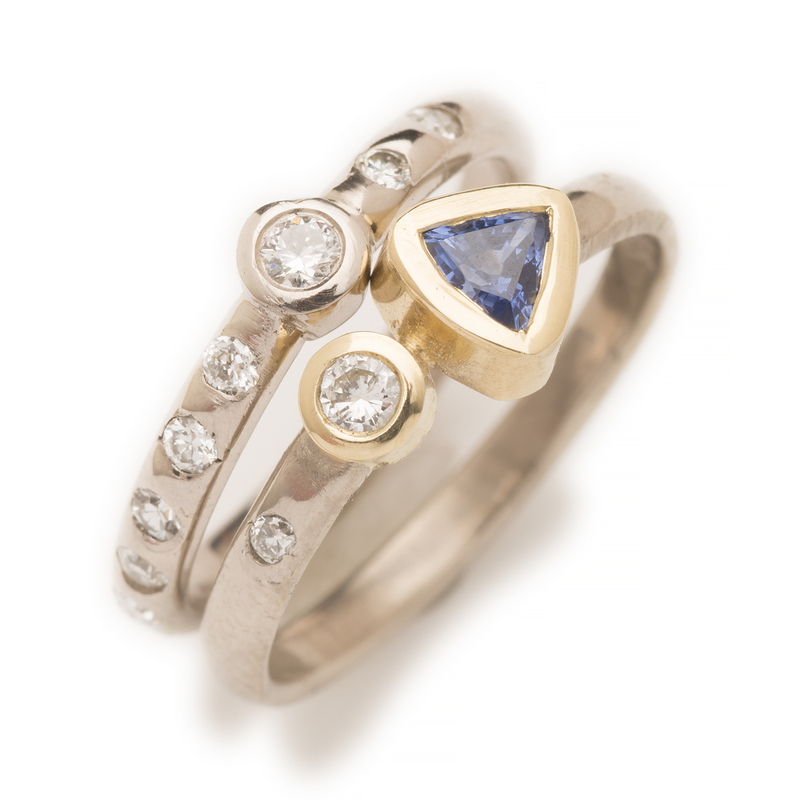 2 Rings: 'Balance' ring with trillion sapphire and diamond and flush set diamonds, band with customer's own diamonds. Custom Ring: 18k yellow band, customer's own oval sapphire, watermelon tourmaline slice, moonstone. Ring: 'venus' 18k yellow gold band, customer's own sapphire, diamond. 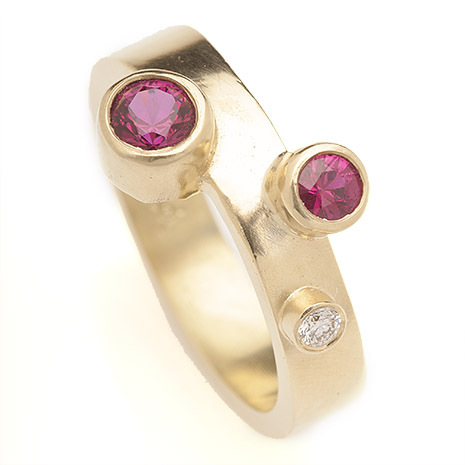 Ring: 'Breaking Borders' 18k band with rubies and diamond. 4mm width. Ring: Hand fabricated and forged, fold formed, hollow forms,18 & 22k yellow gold, oxidized sterling, raw Montana sapphire, faceted sapphire. Available with many stone combinations. Ring: Hand fabricated and forged, fold formed, hollow forms,18 & 22k yellow gold, oxidized sterling, tangerine garnet, vesuvianite (lime green). Available with many stone combinations. 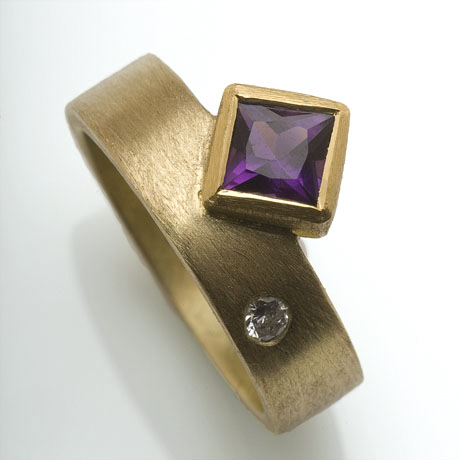 Ring custom: 'Venus' 18k yellow gold band, 5mm amethyst, flush set diamond. 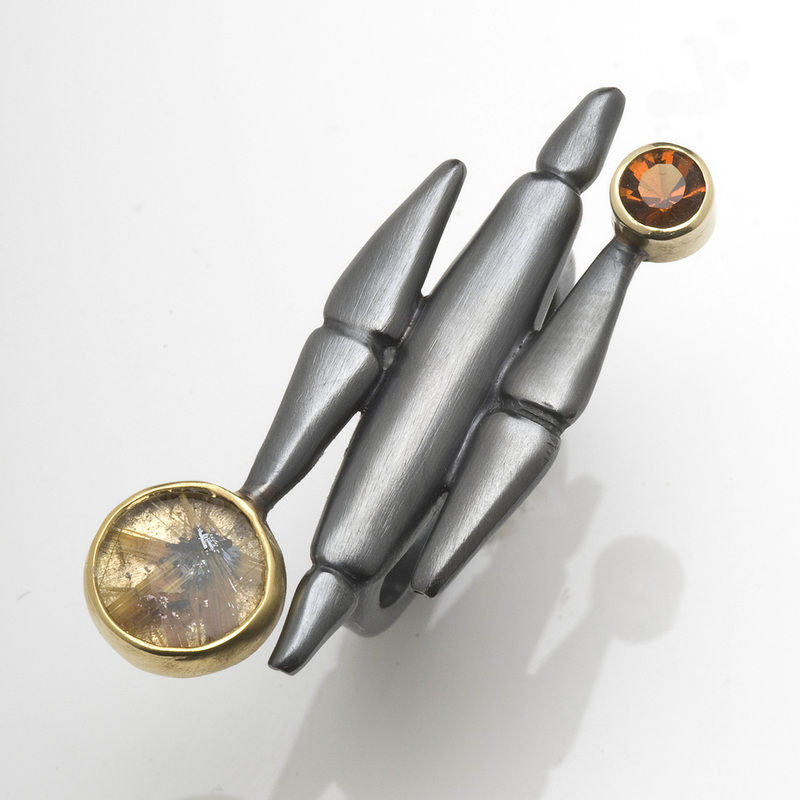 Ring: Hand fabricated and forged, fold formed, hollow forms,18 & 22k yellow gold, oxidized sterling,citrine, rutilated quartz with hematite. Available with many stone combinations. Ring: Hand fabricated and forged, fold formed, hollow forms,18 & 22k yellow gold, oxidized sterling, bi-colored cabachon tourmaline and faceted mint green tourmaline. 2 rings: 18k Palladium white gold, customer's own diamonds. 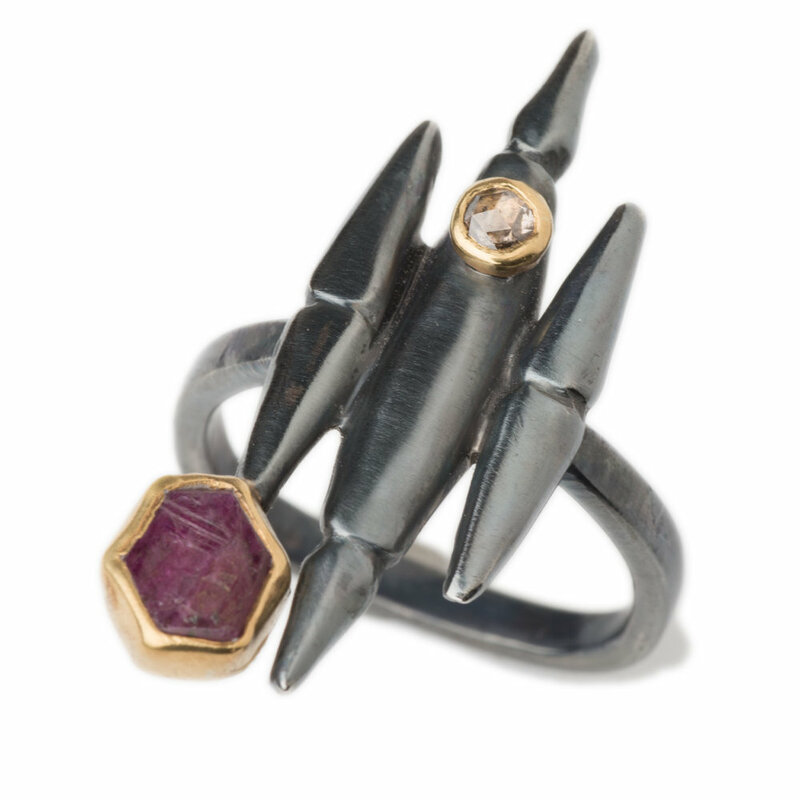 Ring: oxidized silver, 18 + 22k gold, rose cut diamond, ruby slice.